Department of Biophysics, The Norwegian Radium Hospital, Montebello, 0310 Oslo, Norway. Treatment of MDCK II cells with the lipophilic photosensitizer tetra(3-hydroxyphenyl)porphyrin (3-THPP) and light was found to induce a rapid apoptotic response. Furthermore, the distribution of apoptotic cells in microcolonies of eight cells was found to be different from the binomial distribution. This indicated that the cells were not inactivated independently and that secondary effects are involved in cell killing by photodynamic treatment (PDT). The observed bystander effect disagrees with the common view that cells are inactivated only by direct damage and indicates that communication between cells in a colony has a role in the photosensitized induction of apoptosis. The degree of bystander effect varied both with mode of cell death and with cell line. Photodynamic treatment (PDT) acts mainly via singlet oxygen (1O2) generated by energy transfer from photosensitizers excited with visible light. Singlet oxygen has a very short lifetime in cells, so the intracellular targets are close (£ 100 nm) to the sites where the sensitizer is localized . The subcellular localization of a sensitizer varies with its molecular characteristics such as lipophilicity, electrical charge and size as well as with the incubation time and washing procedures . Thus, lipophilic photosensitizers, like tetra(3-hydroxyphenyl)porphyrin (3-THPP) and photofrin, are likely to be localized mainly in the plasma membrane, at least after short incubation times. The mode of cell death induced by PDT is dependent on the sensitizer, the cell line used and the cell density [3,4]. Kessel et al. have launched a theory which states that membrane damage can delay or inhibit apoptosis. In contrast, the present work shows that membrane damage leads to rapid apoptosis. Intercellular signal molecules, like interleukin-1b, which are produced in the apoptotic process, can probably alert neighboring cells that apoptosis is occurring . We have previously shown that cells in microcolonies are inactivated in a cooperative manner by PDT and UVA radiation [7-11]. The distribution of necrotic cells in microcolonies was incompatible with the assumption that cells were inactivated independently of each other. The intercellular signals or cytotoxic substances that mediate this bystander effect have not been identified. Madison Darby Canine Kidney cells (MDCK II) and WiDr cells were subcultured twice a week in RPMI 1640 with Hepes buffer and Hanks salts (Gibco, Paisley, Scotland) supplemented with 10 % fetal calf serum (FCS), 100 U/ml penicillin and 100 mg/ml streptomycin. The cells were incubated at 37 ° C in a humidified atmosphere of 5 % CO2 for 48 h after seeding from a single cell suspension. Irradiation was carried out at room temperature using a bank of four fluorescent light tubes (Model 3026, Applied Photophysics, London, England) with a fluence rate of 2.3 mW/cm2. The emission was mainly in the wavelength region 370-450 nm, with a peak at 405 nm. In some parallel experiments we used a similar lamp, but with fluence rate of 5 mW/cm2. MDCK II cells or WiDr cells were seeded at a density of 3000 per cm2 in 9.6 cm2 plastic tissue culture dishes (Falcon, Lincoln Park, NJ). Two days after seeding the cells were incubated with sensitizer: 1) MDCK II cells were incubated with fresh medium without serum containing 1 mg/ml 3-THPP for 1 hour before light exposure. Then the medium was removed, fresh medium with serum was added and the cells were incubated further (protocol 1). 2) In parallel experiments the MDCK II cells were incubated for 2.5 h with 0.25 mg/ml 3-THPP, washed for 0.5 h with medium containing FCS and irradiated in the fresh medium with the lamp with the highest fluence rate given above (protocol 2). 3-THPP was dissolved in methanol containing 0.1 M NaOH. 3) The WiDr cells were washed with medium without serum, incubated with 1mM 5-aminolevulinic acid for 4 hours in medium without serum, then the medium was changed to fresh medium with 10 % FCS before irradiation with the 2.3 mW/cm2 lamp. We used approximately the same method as previously described to find the distribution of dead cells : Propidium iodide (PI) (Sigma, St. Louis, MO, USA) was used to stain the necrotic cells, while apoptotic cells were detected by addition of Hoechst 33342 (H342) (Sigma, St. Louis, MO, USA). The fluorescence from H342 revealed the apoptotic cells' characteristic morphology, i.e. condensed chromatin and fragmented nuclei. Both dyes were pipetted into the medium to a final concentration of 2 mg/ml each, 5 minutes and 45 minutes before microscopy, respectively. Cell death was scored after 3-4 hours using a 40x water immersion objective (Axioplan, Zeiss, Germany) and UV excitation light. The level of analysing light was kept low and each area on the dishes was observed only once to ensure that the analysis did not cause additional inactivation. Secondary necrotic cells, i.e. cells that displayed both a fragmented nucleus and PI fluorescence, were classified as apoptotic. The Terminal deoxynucleotid Transferase (TdT) assay is based on detection of the internucleosomal DNA-fragmentation that characterizes apoptosis . The 3-hydroxyl termini at DNA strand breaks are elongated with Fluorescein-isothiocyanate-deoxyuraciltriphosphate labled dUTP (FITC-dUTP). Three hours after illumination the MDCK II cells were trypsinated and resuspended to a single-cell solution, washed with 4 ° C PBS, fixed in 3% paraformaldehyd for 15 minutes at room temperature and stored in -20 ° C methanol. Loose cells in the medium were spun down and included in each sample. After removal of the methanol and washing with 4° C PBS, 75 ml fresh TdT-solution (Terminal Transferase Kit, Boehringer Mannheim, Germany) was pipetted into each sample. The cells were incubated in this solution for 45 minutes at 37 ° C in a waterbath, washed once with 4 ° C PBS and twice with 4 ° C RNAse buffer (PBS at pH 7.4 containing 10 mM Tris, 0.15 M NaCl, 2mM MgCl2 and 0.1 % Triton X-100). Subsequently, they were resuspended in 100 ml FITC-streptavidin diluted 1/50 in RNAse buffer, incubated overnight at 4 ° C, then washed with 4 ° C PBS and stained with 300-1000 ml of 1.5 mg/ml Hoechst 33258. Thus, by flow cytometry (FACStarPLUS, Becton Dickinson, San Jose, Ca, USA) it was possible to determine the number of apoptotic cells by counting the FITC fluorescing cells as well as the total number of cells by counting the Hoechst 33258 fluorescing cells. Data from 104 cells were collected for each sample and analysed by Lysis II software. Single cells were discriminated from doublets and clumped cells by gating on the pulse width of the Hoechst 33258 fluorescence signal. The cells were seeded and incubated with 3-THPP the same way as described above. A 12 bit black and white CCD camera (Astromed, Cambridge, England) coupled to a fluorescence microscope (Zeiss, Axioplan, Germany) equipped with a 63 x oil immersion objective was used to record phase contrast images. The 3-THPP was excited with light at 578± 10 nm and fluorescence light with a higher wavelength than 600 nm was recorded. The cells were not autofluorescent in this part of the spectrum. images were taken with the same exposure time and adjusted to the same dynamic range using imager 2 software (Astromed, Cambridge, England) before comparison. The experimental distributions were compared with three different mathematical models for the inactivation of cells as described by Dahle et al. : 1) Primary hit model (H0): Cells within microcolonies are assumed to be inactivated independently of each other. The number of dead cells is according to this model binomially distributed. 2) Neighbour inactivation model (H1): Each cell in a colony has a probability, p, of being inactivated by primary damage. Furthermore, the remaining cells can be inactivated with probability b, via an adjacent cell that has been inactivated by primary damage. This is called a bystander hit. A cell inactivated via its neighbour can not inactivate the remaining, surviving neighbour cells. 3) Propagated inactivation model (H2): As H1 but assuming that a cell inactivated via a neighbour can inactivate its other adjacent cells with the same probability b.
wich is a modified version of the square root transformation for counts . 0t and Et are entry numbers (t dead cells) in the vector containing the observed values and the estimated values, respectively. The minimization was carried out using routines in Mathematica 2.2.3 (Wolfram Research, Illinois, USA). The experimental distributions were tested for statistically significant deviation from the model distributions by using the minimized chi square values. The standard errors of p and b were calculated from a second order linear regression of c2, finding the covariance matrix from the inverse curvature matrix at minimum c2. A significance level of p=0.05 was used throughout. Figure 1 A is a phase contrast image of a typical microcolony, Figure 1 B shows the corresponding fluorescence image with three apoptotic cells (marked with arrows). It was difficult to demonstrate the presence of apoptotic cells in images because the apoptotic cells often detached from the petri dish and moved out of focus of the camera. Figure 1: MDCK II cells incubated with 1 mg/ml 3-THPP for 1 hour in medium without serum and exposed to 8.3 kJ/m2 of blue light. A) Phase contrast image. B) H342 fluorescence image. The cells marked by arrows are apoptotic. Rapid induction of apoptosis by 3-THPP and light was detected by two different methods: 1) TdT staining and flow cytometry (Fig. 2), and 2) by visual detection in the microscope by virtue of the characteristic morphology of apoptotic cells (Fig. 1 and 3). The percentage of apoptotic cells measured by TdT staining and flow cytometry reached a maximum at 2 kJ/m2 of light exposure when treated with protocol 1 and decreased for higher doses (Figure 2). The decrease in apoptotic fraction for higher doses was a combined effect of a higher fraction of necrotic cells and a higher fragmentation of apoptotic cells at high doses. Most of the fragments were not stained with FITC-dUTP, and therefore originated from necrotic cells. Consistent with this, the number of fragments with low DNA content increased when the PDT exposure increased (open circles). The cells treated according to protocol 2 were washed before light exposure and thus received less plasma membrane damage. This resulted in a smaller decrease in apoptotic fraction with increasing dose and less fragmentation of cells. Figure 3 confirms the results in figure 2 for cells treated with protocol 1. This method detects apoptotic cells at a later stage than the TdT method. Therefore a higher light dose was used. Figure 2: Percentage of apoptotic MDCK II cells treated with the two incubation protocols (filled symbols). Circles = protocol 1. Squares = protocol 2. The cells were fixed and stained with dUTP 3 hours after irradiation and then counted by flow cytometry. Cell fragments with a DNA content half or less of a G1 cell is shown with open symbols. The points are from one representative experiment. Figure 3: Percentage of apoptotic and necrotic cells after incubation for 1 hour in 1 mg/ml 3-THPP in medium without serum, irradiation with different doses of light with 3-THPP present in the medium (protocol 1) and incubated for 4 hours before detection. Secondary necrotic cells were counted as apoptotic. Each point represent approx. 150 cells in each of six experiments. The localization of the photosensitizer is believed to be important for the efficiency of PDT and the mode of cell death after PDT [5,14,15]. To obtain a different subcellular localization pattern the cells were incubated with a lower concentration for a longer time in three experiments, washed and irradiated with approximately double fluence rate (protocol 2). This resulted in an increased fraction of intracellularly localized photosensitizer compared with protocol 1, which mainly gave 3-THPP localization on the plasma membrane (Fig. 4). Photodynamic treatment with this different localization pattern also resulted in rapid apoptotic death: secondary necrotic cells were counted 2.5 hours after irradiation. Furthermore, incubation protocol 2 did not influence the degree of bystander inactivation of cells: The value of b2 was not significantly different from the protocol 1 experiments (Fig. 5 A) and the chi square values was similar. Figure 4: The intracellular localization of 3-THPP. image B shows the localization of 3-THPP after 1 hour of incubation with 1 mg/ml 3-THPP in medium without serum, image D shows the localization of 3-THPP after 2.5 hours of incubation with 0.25 mg/ml 3-THPP in medium without serum and washing for 0.5 h. image B and D was adjusted to the same intensity range. image A and C is the corresponding phase contrast images of B and D, respectively. A 63x-oil immersion objective were used to obtain the images. Cells inactivated independently should be binomially distributed in the colonies. This was not observed. Figure 6 shows a histogram of the experimental distribution of apoptotic cells in microcolonies of eight cells. It is obvious from the histogram that the experimental distribution is significantly different from the binomial distribution (H0) (p<0.001) but similar to the two bystander models. 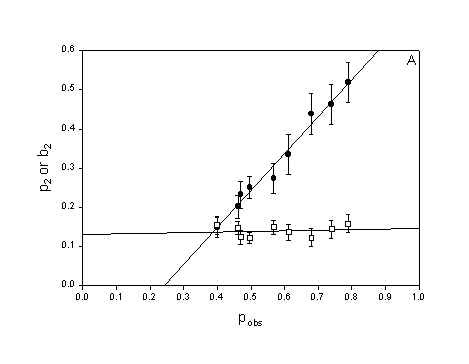 In fact, neither the neighbour inactivation model distribution (H1) nor the propagated inactivation model distribution (H2) were significantly different from the experimental distribution (p-value(H1)=0.30 and p-value(H2)=0.27). Table 1 shows that model H2 was not significantly different from the experimental distribution in 7 of 9 experiments while model H1 was not significantly different from the experimental distribution in 5 of 9 experiments. 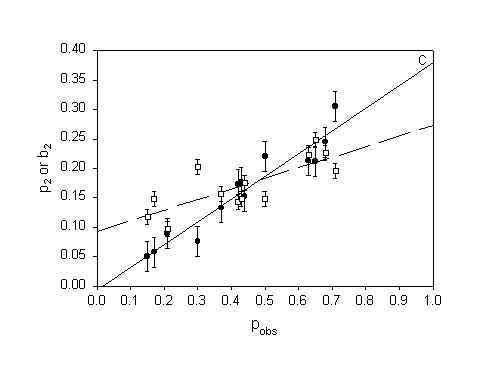 Figure 7 shows that the value of chi-square for model H2 was slightly lower than for model H1 when the fraction of dead cells (pobs) was below 0.6, and that they were approximately equal for values of pobs above 0.6. Consequently, model H2 was the best overall model. 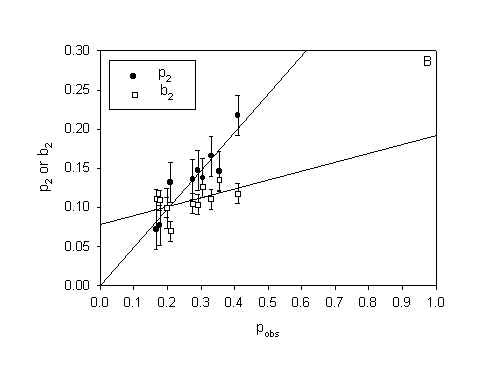 Furthermore, figure 5 A shows that the calculated primary hit probability, p2, increased when pobs increased, while the calculated secondary (bystander) hit probability, b2, was approximately constant. Figure 6: Distribution of apoptotic MDCK II cells in octets incubated with 1 mg/ml 3-THPP for 1 hour in medium without serum and subsequent 9.7 kJ/m2 of blue light. The model distributions show different degree of fit to the experimental distribution. Apoptotic cells were scored 3.5 hours after irradiation by means of fluorescence microscopy. c 2(H0) = 39.0, c 2(H1) = 9.5, c 2(H2)=10.0. TABLE 1: Least chi-squares on model fits for MDCK II cells treated with 3-THPP PDT (both protocols). Figure 7: The chi-square values for the chi-square test of the distributions of apoptotic cells after 3-THPP PDT against the H2 model distribuitons, as a function of the observed fraction of dead cells, pobs. WiDr cells treated with 5-ALA PDT and MDCK II cells treated by Photofrin PDT dies by necrosis [10,16]. Thus plots of p2 and b2 as a function of pobs from experimental distributions obtained from cells dying by necrosis (Fig. 5 B and 5 C) can be compared with the plot of p2 and b2 for cells dying by apoptosis (Fig. 5 A). It can be seen from figure 5 that p2 increases with pobs without regard to mode of cell death. b2 is constant for MDCK II cell dying by apoptosis (Fig 5 A) but increases linearly with pobs when the MDCK II cells die by necrosis (Fig 5 C). b2 increases only slightly with pobs for the WiDr cells. Table 2 show the summarizing statistics for the experiments with WiDr cells and 5-ALA PDT. The summarizing statistics for the MDCK II cells treated with Photofrin PDT is published in . The tables of summarizing statistics show the same tendency regardless of mode of cell death: 1) The binomial model is rejected and 2) The propagated inactivation model is very well fitted to the experimental distribution. TABLE 2: Least chi-squares on model fits for WiDr cells treated with 5-ala PDT. Cells treated as described in the present work did not die solely by apoptosis. For high exposures an increasing fraction of cells died by necrosis (Fig. 3). This observation explains the decrease in apoptotic fraction for high doses of light seen in both figure 2 and figure 3. In figure 2 the fraction of cell fragments was included as well. This is not an absolute number because different cells can be shredded into different numbers of fragments. The increasing fraction of cell fragments with increasing exposures arises mainly from necrotic cells since the fragments were not stained with FITC-dUTP. PDT with 3-THPP has been found to induce apoptosis in V79 cells with a maximum apoptotic fraction 12 h after irradiation . In the present experiments with MDCK II cells the induction of apoptosis was faster. Kessel et al. claim that rapid apoptosis is initiated in the mitochondria, while damage to the plasma membrane inhibits or delays this process. Since 3-THPP is lipophilic we might expect this dye to localize in both intracellular membranes such as the mitochondrial membranes and in the plasma membrane. With short incubation times and no washing we should expect a high fraction of 3-THPP on the plasma membrane and with longer incubation times and washing a higher fraction of 3-THPP should be in intracellular membranes. In contrast to the hypothesis of Kessel et al. both incubation protocols resulted in rapid induction of apoptosis (Fig. 2). Thus, apoptosis may have been induced by the same pathway in the two experimental protocols, regardless of different sensitizer distribution. Noodt et al. have shown that when the concentration of a mitochondrially localized sensitizer is decreased below a certain threshold an indirect pathway of apoptosis is induced by inhibiting oxidative phosphorylation. In their system apoptosis was strongly delayed, with the maximum fraction of apoptotic cells occurring one day after PDT. If, under similar conditions, the plasma membrane concentration of sensitizer is elevated at the expense of the mitochondrial concentration, the plasma membrane effect might appear inhibitory with regard to delayed apoptosis. This will occur even if the plasma membrane effect is stimulatory, but weaker than the mitochondrial effect. Thus, results like those of Kessel et al. might be explained in the case of delayed apoptosis. However, the rapid apoptosis observed in the present system seems to be nearly independent of intracellular sensitizer concentration and distribution, and therefore, probably initiated by damage to the same cellular sensor of apoptosis. Since it is not possible to exclude 3-THPP localization on intracellular membranes in protocol 1, and 3-THPP localization on the plasma membrane in protocol 2, it is not possible to be more specific on which cellular compartment is crucial for the induction of apoptosis based on the results in this paper. A fundamental assumption in photodynamic treatment is that only sensitizer-containing cells are inactivated after light exposure . That is, the cells are inactivated independently of each other. Table 1 and figure 6 show that the binomial distribution was not in agreement with the experimental distributions of dead cells, while the bystander models fitted the data much better. This means that the cells are not inactivated independently. The propagated inactivation model (H2) fitted the experimental distributions best. However, as we can see from figure 7 model H1 and model H2 gave similar fitting for high fractions of dead cells. This is to be expected because at high exposures a large fraction of the are killed by primary damage and only a little difference between the two models is expected. We can conclude that cells are inactivated in a cooperative manner by 3-THPP PDT, and that the bystander effect seems to propagate. This is in accordance with our previous results for MDCK II cells inactivated by necrosis [10,11]. Tables 1 and 2 do not reveal big differences between cells dying by apoptosis and cells dying by necrosis. The biggest difference is the better fit of model H0 and H1 to the data in table 1 than in table 2. But since model H2 was the best model in both cases it is more reasonable to take a closer look at the parameters of this model. This could also explain the differences in fit of model H0 and H1 for cells dying by apoptosis and necrosis since these models are special cases of model H2. The propagated mortality model (H2) contains two parameters, p2 and b2. p2 is the probability of inactivation by direct damage, while b2 is the probability of inactivation after an attack by products generated in a dead adjacent cell . Thus, p2 should increase with the observed fraction of dead cells whereas b2 should remain constant for increasing doses of PDT. This expectation is borne out by the data in figure 5 A and to some extent by the data in figure 5 B. But for MDCK II cells dying by necrosis (fluorescing red) (Fig. 5 C) the probability of dying by a bystander hit is increasing with increasing total cell death. b2 is also higher for MDCK II cells dying by necrosis compared to MDCK II cell dying by apoptotis when we compare at equal pobs. This indicate that the bystander effect is stronger for necrosis than for apoptosis. When b2 increases with pobs it means that the bystander effect is selfintensifying at high cell death. The model has to compensate by increasing the value of the bystander parameter in the model. This is a weakness in the model since the model cells are not expected to change when the number of dead cells change and therefore b2 should be constant with pobs. The explanation why b2 increases with pobs in figure 5 C and not in 5 A obviously must be related to differences in the way cells die by necrosis and apoptosis. Apoptotic cells rounds up and loosen from their surrondings. Apoptotic cells have an intact plasma membrane and are divided into smaller apoptotic bodies. In contrast, necrotic cells swells, get big blebs on the plasma membrane and leak cell content to the surrondings. Thus, the bystander effect in necrosis is selfintensifying in that when the number of dead cells increase more and more toxic substances enter the microenvironment around a colony and eventually kill the remaining neighbours. The bystander effect of apoptosis is constant with increasing cell death since the apoptotic cells are more confined to themselves when they die. The bystander effect also varies with cell line: b2 was lower for WiDr cells dying by necrosis than for MDCK II cells dying by either necrosis or apoptosis. The WiDr cells are cancer cells. Cancer cells are generally viewed as cells where the ability to respond to extra-cellular signals has been decreased . Therefore it is not unlikely that they show a lower degree of bystander effect. Figure 4 shows that some cells take up more 3-THPP than others. These cells probably get the highest damage and could be responsible for propagating lethality to their neighbors. However, this is unlikely to be the explanation because MDCK II cells are inactivated in a cooperative manner by UVA radiation alone . This argument is relevant only if the mechansims of the bystander effect is similar for PDT as for UVA radiation. In any case, this is a source of variance in the results. The mechanisms of cooperativity or bystander effect in PDT are unknown. Artefacts, such as the combination of different PDT susceptibility of cells in different phases of the cell cycle and synchronous growth within colonies, and the prescence of separate clones with different PDT susceptibility, have been excluded in earlier work . A bystander effect has also been observed in suicide gene therapy , gamma irradiation , and alpha particle irradiation [22,23]. A mechanism that has been proposed for the bystander killing of cells in gene therapy is uptake of apoptotic vesicles containing toxic substances produced by the transfected cells which are undergoing apoptosis . This explanation is not likely for the bystander effect in PDT because a bystander effect has been observed also for necrosis after PDT . The work of Mothersill et al. indicates that the bystander effect in gamma irradiation is mediated by a signal released into the medium. We have previously excluded that the bystander effect could be mediated by soluble factors excreted to the medium . The most likely mechanism for the bystander effect in suicide gene therapy is transfer of toxic substances via gap junctions . After alpha particle irradiation it has been shown that the bystander regulation of gene expression is mediated by GJIC . Conceivably, the bystander effect in PDT could be mediated by GJIC. PDT with Photofrin induces a transient reduction of GJIC (unpublished results). The active fraction of Photofrin is of similar lipophilicity as 3-THPP  so it might be expected that PDT with 3-THPP induces a similar reduction. On the other hand, UVA radiation causes a transient increase in GJIC . UVA radiation has also been shown to inactivate celle by a bystander mechanism , probably by a similar mechanism as PDT. A bystander effect has also been verified for monolayers treated with PDT and UVA radiation [27,28]. These results contradict the role of GJIC in the bystander effect of PDT and UVA radiation because GJIC in MDCK II cells in monolayers is downregulated to being practically nonexistent [4,29]. Therefore it is not likely that the bystander effect is mediated by substances transmitted through gap junctions. Other mediators of the bystander effect could be cytotoxic aldehydes produced by PDT-induced lipid peroxidation . Lipid peroxidation itself could also provide a mechanism since lipid peroxidation is known to propagate in chain reactions in the plasma membrane . PDT-induced production of Nitric Oxide (NO) may also play a role since NO is known to induce apoptosis and can readily pass through cell membranes . PDT may cause damage to the cytoskeleton of cells . Epithelial cells are connected by tight junctions. Therefore, signals may propagate by cytoskeleton damage. Further investigations are necessary to reveal the mechanisms of bystander effect in PDT. Thanks to Trond Stokke for suggestions and help with flow cytometry and Lars Smedshammer for help with the TdT assay. JD is supported by the Norwegian Research Council. 1To whom correspondence should be addressed at Department of Biophysics, The Norwegian Radium Hospital, Montebello, 0310 Oslo, Norway. Fax: +47 22 93 42 77. E-mail: jostein.dahle@labmed.uio.no. J. Moan and K. Berg, The photodegradation of porphyrins in cells can be used to estimate the lifetime of singlet oxygen, Photochem Photobiol, 53 (1991) 549-553. K. Berg, J.C. Bommer, J.W. Winkelman and J. Moan, Cellular uptake and relative efficiency in cell inactivation by photoactivated sulfonated meso-tetraphenylporphines, Photochem Photobiol, 52 (1990) 775-781. B.B. Noodt, K. Berg, T. Stokke, Q. Peng and J.M. Nesland, Different pathways to apoptosis induced by tetraphenylporphine derivatives and light in V79 cells, Society of Photo-Optical Instrumentation Engineers, 3191 (1997) 107-113. D. Kessel, Y. Luo, Y. Deng and C.K. Chang, The role of subcellular localization in initiation of apoptosis by photodynamic therapy. Photochem Photobiol, 65 (1997) 422-426. D.L. Vaux and A. Strasser, The molecular biology of apoptosis, Proc. Natl. Acad. Sci. U. S. A. 93 (1996) 2239-2244. T. Christensen and J. Moan, Photodynamic effects of haematoporphyrin (HP) on cells cultivated in vitro..in: R. Pratesi, C.A. Sacchi (eds. ),Lasers in Photomedicine and Photobiology. Springer Verlag, Berlin, Heidelberg and New York: (1980) pp.87-91. J. Moan, T. Christensen and P.B. Jacobsen, Photodynamic effects on cells in vitro labelled with hematoporphyrin derivative, Photobiochemistry and Photobiophysics, 7 (1984) 349-358. J. Moan, S.E. Rognan, J.F. Evensen and Z. Malik, Cell photosensitization by porphyrins, Photobiochemistry and Photobiophysics, Suppl. (1987) 385-395. J. Dahle, O. Kaalhus, J. Moan and H.B. Steen, Cooperative effects of photodynamic treatment of cells in microcolonies, Proc Natl Acad Sci U S A, 94 (1997) 1773-1778. W. Gorczyca, J. Gong and Z. Darzynkiewicz, Detection of DNA strand breaks in individual apoptotic cells by the in situ terminal deoxynucleotidyl transferase and nick translation assays, Cancer Res, 53 (1993) 1945-1951. K. Berg and J. Moan, Lysosomes and microtubules as targets for photochemotherapy of cancer. Photochem Photobiol, 65 (1997) 403-409. B.B. Noodt, K. Berg, T. Stokke, Q. Peng and J.M. Nesland, Different apoptotic pathways are induced from various intracellular sites by tetraphenylporphines and light, Br. J. Cancer, 79 (1999) 72-81. B.B. Noodt, K. Berg, T. Stokke, Q. Peng and J.M. Nesland, Apoptosis and necrosis induced with light and 5-aminolaevulinic acid-derived protoporphyrin IX, Br. J. Cancer, 74 (1996) 22-29. B.B. Noodt, G.H. Rodal, M. Wainwright, Q. Peng, R. Horobin, J.M. Nesland and K. Berg, Apoptosis induction by different pathways with methylene blue derivative and light from mitochondrial sites in v79 cells. Int. J. Cancer, 75 (1998) 1-8. H.F. Blum, Photodynamic action and diseases caused by light,New York: Reinhold; (1941) Reprinted. New York: Hafner, 1964. J.E. Trosko, Hierarchical and cybernetic nature of biologic systems and their relevance to homeostatic adaptation to low-level exposures to oxidative stress-inducing agents, Environ. Health Perspect. 106 Suppl 1:331-9 (1998) 331-339. I.M. Pope, G.J. Poston and A.R. Kinsella, The role of the bystander effect in suicide gene therapy, Eur. J. Cancer, 33 (1997) 1005-1016. C. Mothersill and C.B. Seymour, Cell-cell contact during gamma irradiation is not required to induce a bystander effect in normal human keratinocytes: evidence for release during irradiation of a signal controlling survival into the medium, Radiat. Res. 149 (1998) 256-262. H. Nagasawa and J.B. Little, Induction of sister chromatid exchanges by extremely low doses of alpha-particles, Cancer Res, 52 (1992) 6394-6396. A. Deshpande, E.H. Goodwin, S.M. Bailey, B.L. Marrone and B.E. Lehnert, Alpha-particle-induced sister chromatid exchange in normal human lung fibroblasts: evidence for an extranuclear target, Radiat. Res. 145 (1996) 260-267. E.I. Azzam, S.M. de Toledo, T. Gooding and J.B. Little, Intercellular communication is involved in the bystander regulation of gene expression in human cells exposed to very low fluences of alpha particles, Radiat. Res. 150 (1998) 497-504. J. Moan, K. Berg, H.B. Steen, T. Warloe and K. Madslien, Fluorescence and Photodynamic Effects of Phthalocyanines and Porphyrins in Cells.in: B.W. Henderson, T.J. Dougherty (eds. ),Photodynamic Therapy. Basic Principles and Clinical Applications. Marcel Dekker, Inc. New York: (1992) 2, pp.19-36. H. Banrud, S.O. Mikalsen, K. Berg and J. Moan, Effects of ultraviolet radiation on intercellular communication in V79 Chinese hamster fibroblasts, Carcinogenesis, 15 (1994) 233-239. J. Dahle, E. Angell-Petersen, S. Bagdonas, H.B. Steen and J. Moan, Cooperative effects of photosensitized cell killing. In: Photochemotherapy of cancer and other diseases. Society of Photo-Optical Instrumentation Engineers, Vol. 3563 Washington: (1998) pp.120-4. V.M. Berthoud, M.L. Ledbetter, E.L. Hertzberg and J.C. Saez, Connexin43 in MDCK cells: regulation by a tumor-promoting phorbol ester and Ca2+, Eur J Cell Biol, 57 (1992) 40-50. S.J. Sullivan, R.J. Roberts and D.R. Spitz, Replacement of media in cell culture alters oxygen toxicity: possible role of lipid aldehydes and glutathione transferase in oxygen toxicity, J. Cell Physiol. 147 (1991) 427-433. D. Hedley and S. Chow, Flow cytometric measurement of lipid peroxidation in vital cells using parinaric acid, Cytometry, 13 (1992) 686-692. S. Gupta, N. Ahmad and H. Mukhtar, Involvement of nitric oxide during phthalocyanine (Pc4) photodynamic therapy-mediated apoptosis, Cancer Res. 58 (1998) 1785-1788. K. Berg, A. Western, J.C. Bommer and J. Moan, Intracellular localization of sulfonated meso-tetraphenylporphines in a human carcinoma cell line, Photochem Photobiol, 52 (1990) 481-487.